These people really know what they're talking about. Won't push you to the most expensive product as they aim to make renewables as affordable as possible. The 4 way valve is fitted to the cylinder in place of the cold water inlet. The cold-water pipe is fastened back onto the valve. There is a fitted 12 volt pump on the valve and the supplied stainless steel corrugated pipe connects from this to the flat plate collector. The flow from the collector is piped back to the free end of the 4 way valve completing the circuit. Water is taken from the bottom of the cylinder passed through the collector and returned via the curved pipe to the cylinder. This system was designed for use on Narrow boats but it will work anywhere that there is an available space, 1 meter by 2 meters, on the roof. The collector is modified so that it will function whilst lying flat. This makes it non-directional and it will work no matter which way the boat is facing. It does not matter which way your boat is moored (as long as it is not under the shade of a tree) the system will produce hot water. It will even work on a motorhome depending on the type of cylinder. If you do not have an existing hot water cylinder these can be provided at an extra cost. 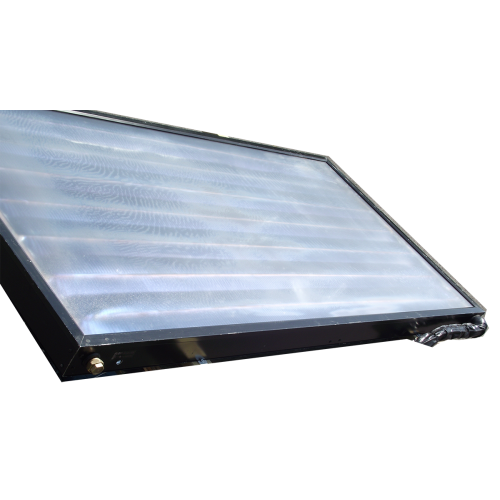 The solar water heating system does not affect the way that you are already heating your water. This will still work if required to supplement or increase the amount of hot water produced. It is just nice to be able to leave the boat moored up for the day and to return to a tank of hot water!! Once ordered we will have to discuss your existing cylinder with you to ensure we send the correct fittings. Some cylinders will require a specially made fitting to suit, but this is all included in the price, but may extend delivery timescale.